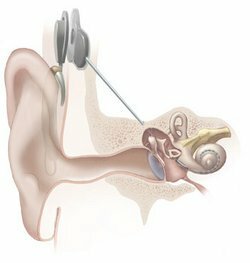 Read an in-depth article on cochlear implants Wikipedia information. The article provides information on the history of the cochlear implant, including Adam Kissiah’s contribution to its development. Following is an excerpt from the Wikipedia article: Cochlear Implants that operate successfully, including those produced by all three major manufacturers (Cochlear Americas, Advanced Bionics and Med-El), incorporate the same basic design. Henry Ford’s Model “T” automobile of the early 1900s, and the Cadillac of the modern era have the same basic design, but differ greatly in the details of each final design. Likewise, all cochlear implants MUST incorporate the same BASIC design to be capable of the ultimate goal of “detecting” or “demodulating” intelligence from the human voice when that intelligence is residing within an electronic signal. The successful cochlear implant must also be capable of converting the pattern of the detected intelligence into an appropriate electronic format for application to the acoustic (eighth cranial) nerve, which in turn further transmits the encoded pattern to the hearing center of the brain, where the information is interpreted as meaningful intelligence. That is why implants from all (three) major manufacturers work equally well in functionality, but are quite different in final design enhancements. Design of this basic conversion process was first described by Adam Kissiah, Jr and was first exposed to the public when it was revealed to James O. Harrell, Esquire, Patent Counsel to NASA’s John F. Kennedy Space Center, in July, 1974. Mr. Harrell also advised exposure to another person capable of understanding the concept. This was done on August 1, 1974. Subsequent Patent Office search and patent application for letters patent was completed in May, 1977. Patent 4063048 was issued to Adam M. Kissiah, Jr. on December 13, 1977; Reissue 31031, which further improved design, was issued on September, 1982. The article also describes the parts of the cochlear implant and how they function. In addition, it discusses the risks and disadvantages of cochlear implants and their controversy in deaf culture. If you’re doing research for a paper, or simply interested in learning about the history of the cochlear implant or implantable hearing devices, the Wikipedia article is a great resource. Is there anyone that is able to answer ONE question regarding my deafness and playing the piano….? “What could I expect the most beautiful clear, harmonious, warm and expressive sounds of the acoustic piano sound like after this invasive Cochlier Implant surgery”? To date the common answer is ‘you will still be able to teach and play the piano’……. I have been a professional pianist and teacher for more then 45 years. I’m currently deaf in my left ear and have been fitted with a receiver (in left ear) that sends sound to my right hearing aid fitted with 3 programmes. The likely reason for this condition being loud music working with big bands and percussion instruments on my left. My right ear is still good with only some pitch loss in the treble between the two C’s of the third octave ONLY when stressed.